in beautiful Tahoe National Forest, is an informal resort "at the end of the road" where the number of guests is limited. It is located in a remote corner of the Sierra Nevada Mountains at an elevation of 6218 feet nine miles northwest of Sierra City, California. It is a place of peace, natural beauty, outdoor recreation, fishing, boating, swimming, hiking, hunting, comfort and wonderful food. The lodge is open only between the snows - usually from Memorial Day weekend through Columbus Day weekend. 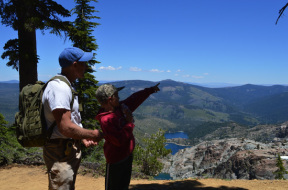 (May 24- October 15) Fifteen fishing lakes lie in the mountains within four miles of the lodge, plus there is Packer Creek, Salmon Creek and North Fork Yuba River. Brook, Rainbow and Brown Trout abound! You will feel at home in your outdoor clothing. You'll be surrounded by winding trails, wildflowers, birds, deer and other wildlife - all situated at the base of the majestic Sierra Buttes. At the lodge, the Dining Room which caters to mountain appetites, is open for dinner Wednesday through Sunday and breakfast Thursday through Sunday (8am to 10am). The "Corner Store" carries candy, fishing supplies, soft drinks, beer, wine and other simple needs. 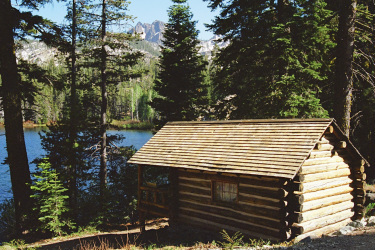 Packer Lake Lodge is in the Lakes Basin region of Tahoe National Forest in California. This region is North of Lake Tahoe and Truckee, and really the only way to get there is on Highway 49. The Lodge is officially located in Sierra City but in reality it is tucked away on the other side of a mountain.